They’re loyal. They’re fighters. They’ll do anything to protect you. 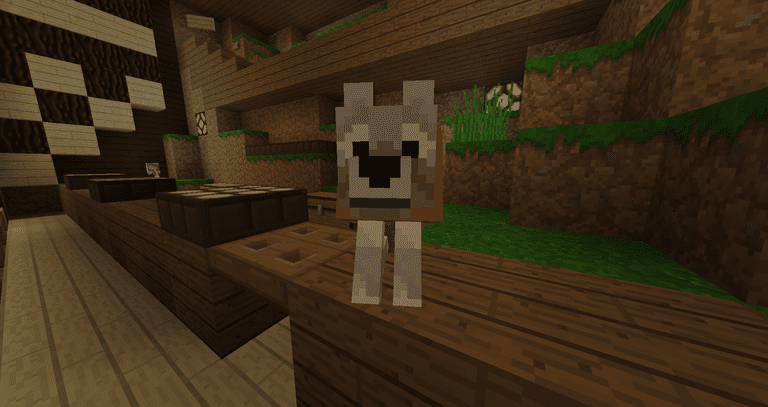 With the small variety of tamable mobs in our game of blocks and bricks, it seems appropriate to talk about the closest thing we have to man’s best friend in Minecraft, the Wolves. They may not be your trusted steed, but they’ll love an adventure! Wolves will naturally spawn in many spots around Minecraft. Particularly, they’re more so found in colder places​ but can be found in warmer ones. The exact biomes in which a Wolf can be found are primarily the taiga biomes (taiga, cold taiga, cold taiga M, and the mega taiga). Wolves can also be found in the forest. They can be tough to find at times, so if you’re having trouble, continue looking and you will surely find what you are looking for. User interaction determines the differences in a Wolf’s state. The various states are as follows; Tamed, Wild, and Hostile. A tamed Wolf has a collar around its neck signifying the dog is owned by a player. The collar can be changed various colors by right-clicking a Wolf with a Dye. Right-clicking a tamed wolf while not holding a Dye or Lead will make the dog sit and stay where they are placed. If a tamed Wolf is following the player and is any more than ten blocks away, the Wolf will teleport to the nearest available spot to the player. A wild Wolf is not aggressive when approached by a player. A wild Wolf is aggressive to Skeletons, Sheep, and Rabbits, however. A wild Wolf does not have a collar like it’s tamed counterpart and has two ‘squinting’ eyes, while a tamed Wolf has more of a friendly look in their eyes. Wolves generally spawn in packs of four​ but can be found away from their pack. A hostile Wolf will be aggressive towards the player or a mob and is initiated when attacked or provoked. When hostile, the Wolves will have red eyes, and darker spots of fur to attempt to intimidate the player. They attack very fast and can deal large amounts of damage if the player being attacked is not careful. Hostile Wolves generally do not stop attacking the player or mob until they are killed. If you are wanting to tame a Wolf, give the Wolf a bone. When giving a bone to a Wolf, the bone has a 33% chance of working. When the Wolf is tamed, he will act as listed previously. If you have multiple tamed Wolves, you will be able to breed. Giving Wolves whatever type of meat will allow a Puppy to be born. When a Puppy is born, they will have the exact same traits as a tamed Wolf. While on the subject of feeding a Wolf meat to breed, meat also heals the dog. The lower a tail is on a Wolf, the less health it has. When feeding meat to a Wolf, you will notice the tail moving upwards if the Wolf has been injured. The moment the tail stops moving in an upward direction is the moment the Wolf has been fully healed. Tamed Wolves will attack various mobs and players that attack their owner. Not only will Wolves attack what attacks their player, but will attack what the player attacks. They are a great companion when fighting as they will deal a hefty amount of damage to the mobs a player is in combat with. Learning to utilize Wolves in combat is a great and very easy thing to accomplish. Having an extra hit while fighting a mob or another player could easily save your life in a survival situation. Wolves make a great companion and can bring a lot of joy into your Minecraft world. They can get you out of a sticky situation and are able to continue being loyal to you in the process. Man’s blocky best friend will make a great addition to your team. Go out and find your new friend!